Voting rights advocates, after successfully challenging Wisconsin’s voter ID law this week, filed suit today challenging early voting restrictions in Ohio. The GOP-controlled Ohio legislature, after repeatedly attempting to cut early voting in 2012, earlier this year eliminated the state’s first week of early voting—the “Golden Week” when voters could also register at the polls. In addition, Ohio Secretary of State Jon Husted issued a directive abolishing the last two days of early voting before Election Day and eliminating early voting hours on weeknights and Sundays, when African-American churches traditionally organize “Souls to the Polls” drives. In 2012, 157,000 Ohioans cast ballots during early voting hours eliminated by the Ohio GOP, according to a lawsuit filed by the ACLU on behalf of groups including the Ohio NAACP and the League of Women Voters. As in Wisconsin, the lawsuit contends that such cuts violate the Equal Protection Clause of the Fourteenth Amendment and Section 2 of the Voting Rights Act (VRA) by disproportionately burdening black voters. Blacks in Ohio were far more likely than whites to vote early in 2008 and 2012. “In the November 2008 election in [Cleveland’s] Cuyahoga County, African Americans voted early in person at a rate over twenty times greater than white voters,” according to the Lawyers’ Committee for Civil Rights. In cities like Cincinnati, Columbus and Dayton blacks voted early in numbers far exceeding their percentage of the population. 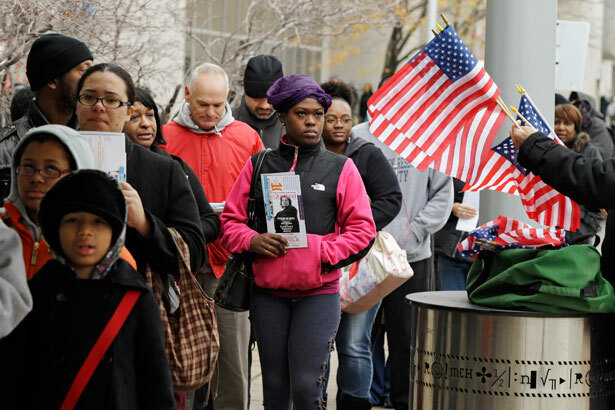 In the 2004 election, before Ohio adopted early voting, there were extremely long lines in large urban counties and African-American voters waited nearly three times as long as white voters to vote. One survey estimated that 130,000 Ohioans left the polls without casting a ballot. George W. Bush won the state by only 119,000 votes. Few lawsuits have been filed challenging early voting cutbacks under Section 2 of the VRA, because early voting is a recent reform and Section 2 has traditionally applied to vote dilution cases, so the outcome in Ohio will likely have larger national implications. Ohio is not the only battleground state to restrict early voting this year. 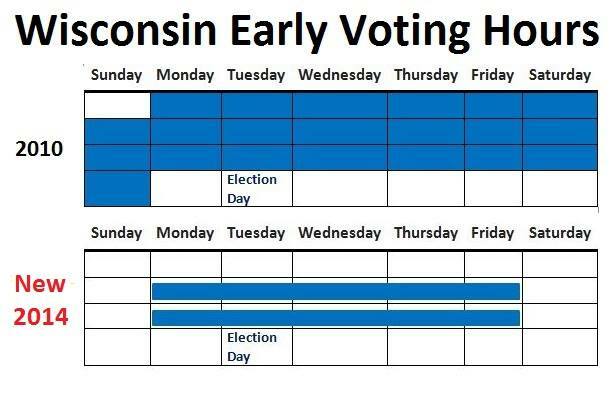 In March the Republican-led Wisconsin legislature eliminated early voting hours on nights and weekends, when it’s most convenient to vote. Take a look at this chart comparing early voting hours in 2010 versus 2014. Over 250,000 Wisconsinites voted early in 2012, one in twelve overall voters. Cutting early voting has a clear partisan purpose: those who voted early broke for Obama 58 to 41 percent in Wisconsin in 2012, compared to his 51 to 48 percent margin on Election Day. Last July, as part of the nation’s harshest anti-voting law, the North Carolina legislature cut a week off early voting and eliminated same-day voter registration, which the Justice Department and voting rights groups are also challenging under Section 2 of the VRA. Seventy percent of African-American voters in North Carolina voted early in 2008 and 2012. During the 2012 general election, over one-half of North Carolinians voted early, with about 900,000 ballots cast during the seven days of early voting that have now been eliminated. If just four percent of those voters showed up on Election Day, waiting times to vote would have more than doubled, according to Ted Allen, professor of industrial engineering at Ohio State, who literally wrote the textbook on lines and waiting times to vote. But some people just can’t afford to spend their time in line. With longer waits, Allen calculates that 18,000 people would have given up in frustration and left the lines without voting. And that’s just a low-end estimate: In a worst-case scenario, waiting times would have been just shy of three hours to vote. For perspective, that’s how long it takes to drive from Raleigh to Charlotte. Early voting cuts are the most indefensible aspect of the Republican war on voting. They inconvenience voters across the political spectrum and disproportionately harm those voters who have historically been excluded from the political process. After public outcry following the 2012 election, Florida Republicans repealed their early voting cuts. “For Republicans who want to make their whole thing on eliminating early voting, I think that is a mistake,” Rand Paul said recently. But Republicans in Ohio and Wisconsin are still doubling down on making it harder for people to vote.